St. Francis’ feast day is October 4th which makes this time of year perfect for reading about St. Francis and other saints who have followed in his footsteps. 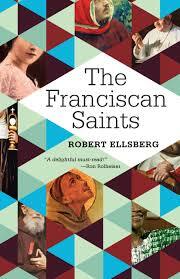 Robert Ellsberg makes learning about these holy people easy in his latest offering, The Franciscan Saints (Franciscan Media). Ellsberg points out that St. Francis is immensely popular, “honored in every land, even by the secular-minded and people of other faiths.” He begins with a short biography of this founder of the Franciscan Order who was known for his authenticity and putting the Gospel into practice. He then goes on to tell about the lives of over a hundred Franciscans, “many, but not all, drawn from the long list of official Franciscan saints.” Over the past 800 years, these individuals have shared an “evangelical zeal, humility and simplicity of life, closeness to the poor, a spirit of prayer, and a certain freedom from the cares of a world preoccupied with greatness, power, and grandiose ambitions.” With the exception of St. Clare, St. Francis’ close friend and one of his earliest followers, whose biography immediately follows his, the saints are listed by chronological order by date of death. On these pages, one will find many well-known Franciscans such as St. Anthony, St. Bonaventure, St. Thomas More, St. Maximilian Kolbe, and St. Padre Pio. Many lesser known saints are also included as well, such as Blessed Jacopone of Todi who wrote the Stabat Mater, St. Leonard of Port Maurice who popularized the Stations of the Cross, and Servant of God Thea Bowman who strongly promoted African-American Catholicism. Those profiled are from different walks of life but each provides a model of holiness. Ellsberg writes in an accessible style which is easy-to-understand and enjoyable to read. Each short biography ends with a quote either by or about the holy person. These quotes are well-worth some time of reflection. The Franciscan Saints would be an inspirational gift for any Franciscans you might know or anyone who is interested in saints. It is perfect for reading a saint each day. We know nothing about St. Peter’s wife, but we do know that he had one because his mother-in-law is mentioned in Matthew 8:14. Jesus healed her and then she got up and started serving all the people who were there. But, what about his wife? She provides fertile ground for the imagination and that is what Catherine Magia has done in TheFisherman’s Bride – she imagines a life for this enigmatic figure lost to history. In her vision, Simon is the oldest of her father’s apprentices in the fishing business. She is 15 years old and her father has arranged a prosperous marriage for her to an unkind man. Simon offers to save her from this fate, but in choosing him, she is disowned. Under challenging circumstances, she goes on to build a life with her husband and his band of fishermen. When Jesus enters their lives, everything changes, and when Simon leaves all behind to go and follow him, that includes his wife at home who must then pick up the pieces and carry on. Lately, I’ve been thinking a lot about generational sin – the negative behaviors and attitudes that get passed down from parent to child over and over again. We are all a product of our upbringing. As most of us realize sometime in our teens (if not sooner), our parents are people and they are flawed. No one has a perfect childhood and most of us experience enough dysfunction to write a book. By the same token, we go on to become imperfect parents. Even with our best efforts, we mess up this challenging parenting experience. We may make a conscious effort to parent differently from the way we were raised, but we still make a boatload of mistakes; we just make different ones. 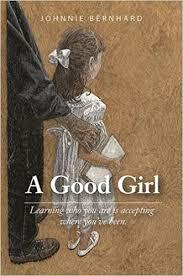 A Good Girl (Texas Review Press), a new Catholic novel by Johnnie Bernhard, tackles the subject of generational sin in one Irish-American family. Gracey Reiter is heading home to South Texas to be with her father, Henry, as he dies. She’s suffering through the “emotional abyss of a three-decade-old marriage” in which she is a low priority in her husband’s life and trying to prepare for her daughter’s wedding. Going back home forces Gracey to look back at her own troubled childhood and the various life stories of a few generations of grandparents, starting with Patricia Walsh, a fourteen-year old girl who travelled to America to escape the poverty of County Galway, Ireland. Bernhard deftly weaves together the past and present in this raw, thought-provoking novel. Some of the stories are truly heartbreaking. There are a couple of troubling moments from a Catholic perspective – Gracey goes to bed with her future husband on their first date, and the family spreads Henry’s ashes instead of burying them (which is against Church teaching) – but overall, A Good Girl is a moving story that ends with forgiveness and hope for the future. 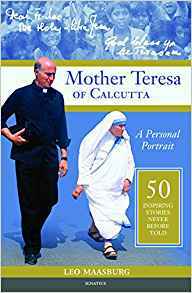 As a Christmas present last year, my parish handed out copies of Mother Teresa of Calcutta: A Personal Portrait (abridged edition) by Fr. Leo Maasburg. I’m a bit embarrassed to say that it has been sitting in my reading pile since then, but with her September 5th feast day right around the corner this was the perfect time to read and appreciate this wonderful book. Fr. Maasburg was a close associate of Mother Teresa and accompanied her on many trips so that she and her fellow sisters could have a priest to offer the Mass for them. As such, he has many wonderful stories about the saint to share. He testifies to her life of service rooted in prayer, her distribution of over 40,000 Miraculous Medals, her humility, the way she treated everyone from all faith traditions as a child of God, and her work on behalf of unwanted children. Wow! I do try very hard not to engage in gossip, but to never say anything negative about anyone is quite a challenge. This did not mean that Mother Teresa did not speak against evil – she did. What she did not do was attack the person – she separated the act from the person committing it. She trusted that God was the judge and that her job was to love everyone regardless of who they were or what they had done. That is definitely something to work on and a goal to aspire to. What if instead of complaining about or judging someone, we prayed for them. What would life look like if we chose to see the good in everyone? What would life look like if we treated every person (starting with those in our own family) as a beloved child of God?